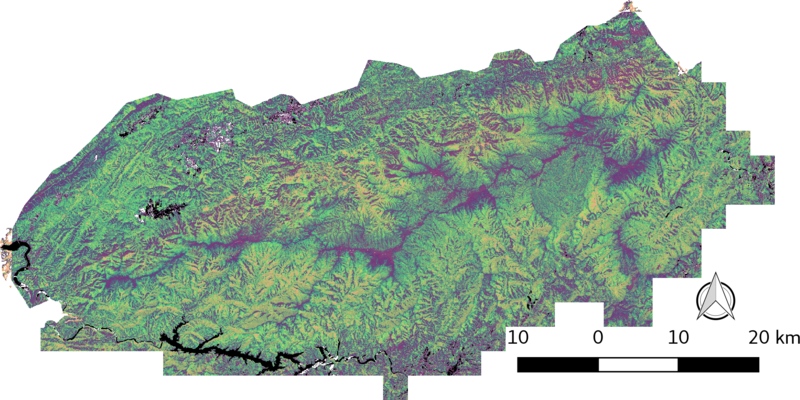 This dataset provides multiple-return LiDAR-derived vegetation canopy structure at 30-meter spatial resolution for the Great Smoky Mountains National Park (GSMNP). Canopy characteristics were analyzed using high resolution three-dimensional point cloud measurements gathered between February-April 2011 for Tennessee and during March-April 2005 for North Carolina sections of the park. Vegetation types were mapped by grouping areas of similar canopy structure. The map was compared and validated against existing vegetation maps for the park. Archived by National Aeronautics and Space Administration, U.S. Government, ORNL_DAAC. https://doi.org/10.3334/ORNLDAAC/1286. Kumar, J., J. Weiner, W.W. Hargrove, S.P. Norman, F.M. Hoffman, and D. Newcomb. 2018. LiDAR-derived Vegetation Canopy Structure, Great Smoky Mountains National Park, 2011. ORNL DAAC, Oak Ridge, Tennessee, USA. https://doi.org/10.3334/ORNLDAAC/1286.